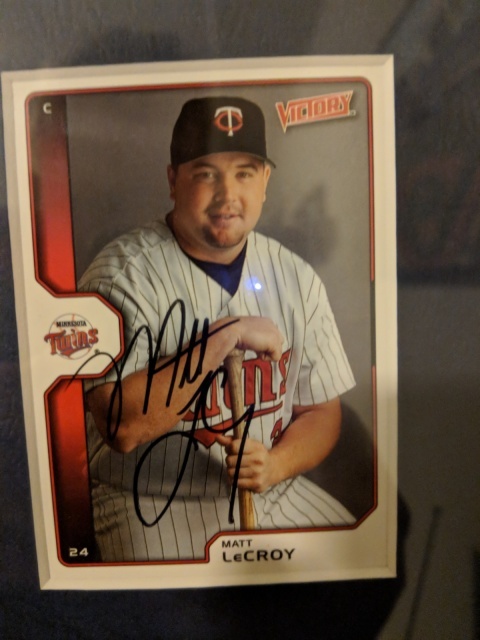 Let's see those autographs from failed prospects, sub-par MLB players, and gimmick players in your Twins' fandom! I can't remember if I posted this before. Matthew LeCroy was part of a very funny occurrence. Spring training, 2004. Mientkiewicz gets a single in the second half of a game. LeCroy asks Gardy if he can go in to pinch run. Gardy gives the thumbs up and makes the move. Mientkiewicz said after the game that waiting for LeCroy to get from the dugout to first base was the longest two and a half minutes of his life. I have two that are regrettable, but in my defense I won them in Twitter contests from the Twins. I didnt actively seek them out. Danny Santana and Byung-Ho Park. In 1990 I was 13 and Kirby Puckett ranked as a god in my book. We went to a game vs. the Red Sox (Roger Clemens was pitching) at the Dome for my upcoming birthday. This was always a big deal since we lived 200 miles from Minneapolis so we always showed up as early as possible and I'd try to get autographs (unsuccessfully, almost always). Before the game as players were warming up I yelled at everyone trying for an autograph with no luck. Finally, Johnny Moses came over and signed my ticket. Sweet! Then, right as I'm giving up, Kirby comes by and signs my ticket. YES!!!! So while it's my favorite piece of memorabilia, it has Johnny Moses autograph on it, making Kirby's that much harder to make out. Still have it framed here on my desk though. I have one that is the opposite of regrettable but it was from a player that was forgettable - I had my picture taken with Matt Kinney and he thanked me for coming to the game. Clearly I remember that! I ruined my 1987 homer hanky with a Les Straker autogragh...........so yeah....Les Straker. Back in '94 I won a Chuck Knoblauch autographed ball in a raffle. I immediately sold it to another guy there for $20. Not sure what a ChuckKno ball sells for these days, but No Regerts. Third best starter, by far, on World Series team.That's not ruined in my book. Only autograph I ever got was on a baseball by Jim Perry. Nice get but the regrettable part is that it was the only baseball we had so we were already playing with it by the end of the day. No brainer at the time but now I kind of wish I still had it. Third best starter, by far, on World Series team. That's not ruined in my book. Actually, Berenguer could have a decent argument for being our 3rd/4th best starter that year, we just didn't use him in that role much. We should have traded for Dennis "Oil Can" Boyd and then combined him with Juan "El Gasolino" Berenguer as our new rotation. Instead of arguing the merits of a 4-man rotation versus 5, we could have had a 2-cycle! The Twins blowout pitcher in the post-Gladden years, if my memory is correct. Well, then based on ERA Straker would still have been our best reliever followed by Reardon at 4.48. Viola and Berenguer were the only guys on the entire team with an ERA below 4.Blyleven, Straker and Reardon were the only others below 4.5.Most of the rest of the stafff had ERA's over 6.00. Main point being Straker had the 4th best ERA on the entire team, starting or otherwise. If I kept memorabilia I would be pretty happy to have his signature on a homer hanky. The Twins had a broadcast auction a couple of years back. I bought a couple of backpacks. One had a signed Ricky Nolasco ball. Yay! This wasn't a regrettable autograph but a funny one. I was sitting in the dugout during an old timers game in St. Pete, Florida back in mid 1990's. A friend of mine gave me and my wife two passes that could get us anywhere in the stadium. So before the game started we walked out onto the field and jumped in the dugout. I sat down next to Harmon and started talking Minnesota baseball, the fact that I was a huge fan, etc., etc. About 5 minutes later Blyleven sits down next to me and I about lost it. Sat there almost the entire game talking to both of them. At the end of the game I asked Harmon to sign the pass I was wearing around my neck. He happily obliged. I turned to Blyleven and asked him to sign it too. He laughed and said he would only sign the other side of it. He told me he didn't want to decrease the value of the autograph by signing his name next to Harmon's. Mr. Killebrew laughed out loud at that comment. Edited by twinssporto, 17 March 2018 - 11:32 AM. les straker, 1987 world series game 3 start: 6ip, 4h, 0r, 2w, 4k, departed with a 1-0 lead. twins lost 3-1 after juan berenguer faced five batters in the 7th and blew the save: 1/3ip, 4h, 3er. some days you eat the bear, some days the bear eats you. I have Fred Toliver's autograph on a baseball, signed by multiple other Twins.